DIRECTIONS: Use 5 g (1 level teaspoon) for each 40–80 L (10 to 20 US gallons) of water each day until desired pH is attained and maintained. Thereafter, use as required to maintain pH, usually no more than once every two to three weeks. TIPS: It is best to dissolve the buffer in freshwater before use. Use when setting up an aquarium or making water changes (preferably after the addition of Seachem’s Cichlid Lake Salt™) and between water changes as needed to maintain pH. 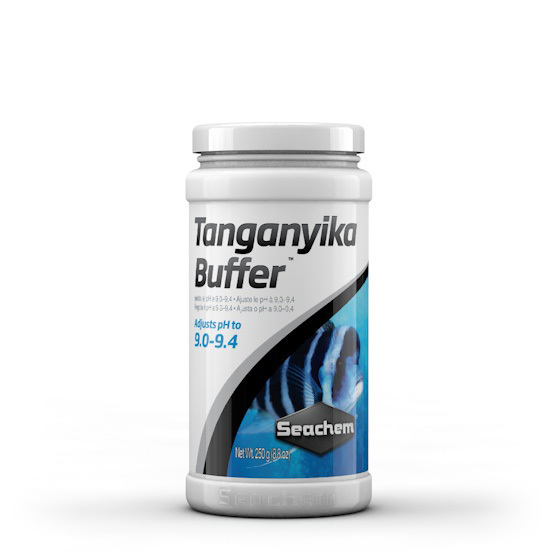 Seachem’s Tanganyika Buffer™ is formulated to maintain a pH between 9.0 and 9.4, depending on the amount used. For lower pH, use Malawi/Victoria Buffer™ (pH 7.8–8.4), either alone or in combination with Tanganyika Buffer™.